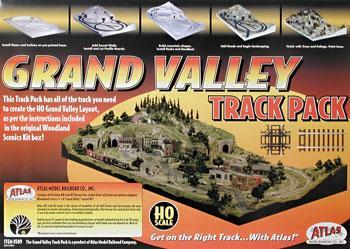 This is an HO Scale Grand Valley Track Pack Layout from Atlas. It's for experienced train collectors. Retail $139.95 SAVE 24% ! Ideal use with Woodland Scenics' "Grand Valley HO Layout" (WOOU0483). Code 83 track is for all skill levels. Track is realistic and reliable. Assortment track pieces are not sold separately. Train track display scene on box packaging is not included with this kit. This kit includes just track and bridge pieces.